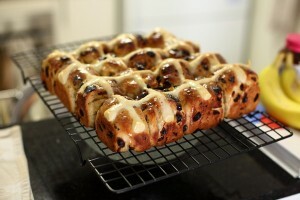 Ok so here is the recipe of my latest attempt at Hot Cross Buns. They were a lot lighter and fluffier this time, and a bit richer due to the extra egg and a bit more butter. I also put them in a really warm place near the cooktop where I was cooking dinner so they rose quite well. I think the softer flour helped too. 1. Whisk flour, sugar, yeast, allspice, cinnamon and 1 teaspoon sea salt in a bowl until combined. Heat milk and butter in a small saucepan until tepid (about 40C, no more or it will kill the yeast. If it gets hotter than this then leave it until it cools to tepid before adding to dry ingredients. 40C is about body temperature if you don’t have a thermometer). Add eggs to milk mixture, whisk. Make a well in the centre of the flour mixture, add milk mixture and stir until roughly combined. Transfer to the bowl of an electric mixer such as a kitchenaid or kenwood mixer with dough hook attached and mix for 3-4 minutes until a smooth elastic dough forms. Alternatively you can knead by hand for about 10 minutes. 2. Spray a large bowl with oil spray, place dough inside and cover with cling film. Put bowl in a warm place for 40-50 minutes or until at least doubled in size. If the dough is not bulging out at the top leave it longer, this is crucial for a fluffy dough. Knock back dough by punching lightly and knead in sultanas and raisins. Cut dough into 12 equal pieces, roll into balls and place in a greased rectangular baking tray. Cover with cling film and stand in a warm place for 30-40 minutes or until doubled in size. 3. For the cross, preheat oven to 220C. Combine flour and 1/4 cup water and stir to a smooth paste. Spoon into a ziplock bag, cut off the tip of one corner and pipe lines down the centre of each row of buns to form crosses. Bake for 10 minutes, then reduce temperature to 200C and bake for another 10 minutes until golden. 4. For glaze, combine sugar and cinnamon with 1/4 cup water in a small saucepan over medium heat, stirring until sugar dissolves. Bring to the boil, reduce heat and simmer for 2 minutes until glaze has thickened. Transfer buns to a wire rack to cool. Brush glaze over hot buns with a pastry brush and leave to cool. * Soft flour is also called cake or biscuit flour, with a protein content of about 9g/100g flour. It is available at most large Australian supermarkets. Even at smaller retailers you can normally find a plain flour with a gluten content of about 9.5g/100g. ^Place raisins and sultanas in a medium bowl and cover with boiling water. Soak 10-15 minutes then drain and squeeze out excess moisture in a clean tea towel. You are currently browsing the Tina’s Foodie Blog weblog archives for March, 2010. Entries (RSS) and Comments (RSS). 26 queries. 0.297 seconds.